The benefits of L-arginine are impressive, from increasing circulation to lowering blood pressure and warding off heart disease. High cholesterol is something that affects nearly 63 million Americans, many who are not even aware that they have high cholesterol. It’s a precursor for hundreds of cardiovascular diseases such as atherosclerosis, diabetes, high blood pressure, heart disease and stroke. However, L-arginine can help with high cholesterol. Studies have shown L-arginine lowering bad cholesterol and influencing good cholesterol, also known as low density lipoprotein and high density lipoprotein. In 1999, researchers found that by adding L-arginine to the specific diets, cholesterol levels could be effectively lowered. How does it work? It is well known how effective L-arginine is on improving circulation, breaking down plaque build-up and warding off cardiovascular diseases. By its very nature, L-arginine and nitric oxide is the body’s most potent blood vessel expander and thus main blood pressure regulator. With all of the benefits of L-arginine in relation to circulation, it is not surprising that it can also potentially lower cholesterol levels. When too much cholesterol is present, either because of poor diet, poor exercise regiments, weight issues, or a family history, that cholesterol can create a plaque build-up within the artery walls. Plaque, essentially a thick, hard deposit that gets ‘left behind’ on the artery walls, can narrow that space and restrict blood flow. Over time, this narrowing of the arteries can lead to atherosclerosis, or hardening of the arteries, which can lead to disastrous cardiovascular diseases such as heart disease and stroke. High cholesterol, resulting in plaque build-up, also restricts the crucial production of Nitric Oxide through the endothelial cells. These amazing little elements rest within the walls of the arteries and line those arteries from your heart to your toes. Endothelial cells are crucial for the production of Nitric Oxide, which as we’ve mentioned is the key element in controlling circulation and blood pressure, along with a host of other mechanisms within the body. When the endothelial cells, also known as the endothelium wall within the arteries, become covered and plastered with plaque build-up from high cholesterol, those amazing cells cannot produce Nitric Oxide, thus the body loses its ability to control circulation and keep blood pressure low. L-arginine is a precursor to nitric oxide, the essential element that has the ability to widen the blood vessels to increase blood flow. 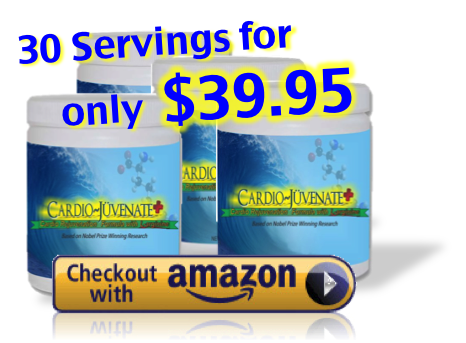 When L-arginine is added to your diet, as in Cardio Juvenate Plus, it increases the body’s ability to regain control of circulation. As L-arginine increases circulation, produces Nitric Oxide, and widens the arteries, it can break down plaque build-up and give those endothelial cells a chance to produce Nitric Oxide again. Dr. John Cooke of Standord University is well known for his research into Nitric Oxide and L-arginine. In one noted study, Dr. Cooke gave 43 patients with increased cholesterol levels a nutritional bar with L-arginine. Taken daily, after just one week this group noticed significant improved levels of peripheral blood flow compared to the control group who was given a placebo bar.